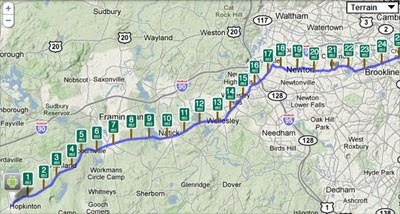 RunKeeper, the iPhone and Android phone run tracking application, has two contestants in today's Boston Marathon. Both runners will be tracked live on a Google Map. Jason (with an iPhone) and Aaron (the Android phone) will both be running the race and their progress will be tracked using RunKeeper and Google Maps. If you go to the site at 10:30am EST you will be able to watch the race live on the map and find out whether the iPhone or the Android wins. RunKeeper is a smart phone application that enables you to use the built-in GPS in your phone to track your outdoor runs, including duration, distance, pace, speed, elevation, calories burned, and view the path travelled on a Google Map. The Boston Marathon map will demonstrate RunKeeper's new 'RunKeeper Live' feature that gives users the ability to broadcast an activity as it's happening in real time.